SMEI (The Solar Mass Ejection Imager) is a collaboration between this group, the University of California at San Diego and the US Air Force Research Laboratory. It is carried on the Coriolis satellite which was launched as part of the "Space Test Program" on 6 January 2003. The SMEI instrument detects transient disturbances in the solar wind by imaging the thomson-scattered light from the free electrons in the solar wind plasma. To do this it uses three CCD cameras, each looking through a baffle with a 60 by 3 degree field of view designed to minimize the stray light falling on the detector. These cameras are so arranged that in the course of an orbit (102 minutes) almost the entire sky is imaged. By this means it is possible to map the heliosphere from about 0.4 AU to the Earth and beyond at a much greater cadence than has hitherto been possible. Transient disturbances in the solar wind are know to be responsible for causing geomagnetic disturbances at Earth. These magnetic storms can disrupt communications, cause power cuts and damage satellites. It is therefore important to be able to forecast the occurence of such storms. The primary goal of the SMEI mission is to evaluate the usefulness of remote sensing of the heliosphere as a tool in making such forecasts. Transient interplanetary disturbances such as those seen by SMEI, are now known to be the interplanetary counterparts of the coronal mass ejections seen in the corona by instruments such as LASCO. An understanding of these events requires that their propagation into the heliosphere be understood as well as their launch into the corona. One of the sources of energetic particles in the heliosphere is the interplanetary shocks which bound transient disturbances. Therefore in conjunction with the EPAM (and to a lesser extent HISCALE) instrument SMEI observations can be used to increase our understanding of the acceleration and propagation of shock-accelerated particles. SMEI observes almost the whole sky every 102 minutes and needs to be able to do accurate relative photometry in order to detect the faint thomson-scattered light from the solar-wind electrons. Thus it is able to detect brightness changes in objects brighter than about 10th magnitude with that cadence and without the interruptions of daylight, something no other current instrument is able to do. This capability means that SMEI is able to monitor the brighter variable stars, detect asteroids and comets, and see supernovae in nearby galaxies. Perhaps the most exciting possibility is that SMEI should be able to detect large extra-solar planets which eclipse their parent star. 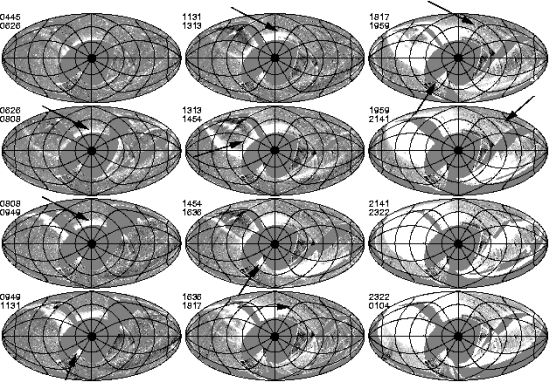 No other current instrument is capable of doing such studies over the entire sky. The SMEI home page at NSO. The SMEI page at UCSD. The image shown here is of a major interplanetary disturbance as seen by SMEI on 29 May 2003. The linked image shows the full sequence of the transient as it travelled out through the SMEI field of view. This disturbance was responsible for a major geomagnetic storm at Earth. White indicates enhanced solar wind density, black shows reduced density. 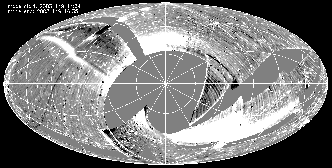 This is an image of the entire sky as generated from the SMEI cameras. It was assembled from 4 sequences of observations made at 2 month intervals using the highest resolution mode of operation. The apparent arc intersecting the galactic plane at about RA=5h, Dec=50N is caused by stray light in one of the cameras.